The folding washing line is perfect for a whole family whilst on their camping or caravanning trip; it has a generous four arm clothes line to give it a maximum drying area, and also has a sturdy 25kg load capacity to allow a large amount of clothes to dry at once. It is also supplied with three securing ground pegs to ensure that it can withsand windy conditions. 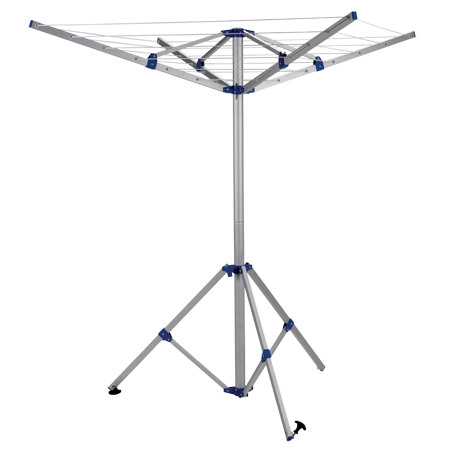 Measuring H 143cm x L 158cm x W 158cm at its full size, the washing line folds to a compact size, has a light weight of 2.8kg, and is supplied with a carry bag for easy storage and transportation.